A bread book isn't a bread book without a recipe for biscuits. Don't worry. Williams-Sonoma Bread definitely has a recipe for them, and it comes with a great side note that you all should definitely keep in mind! 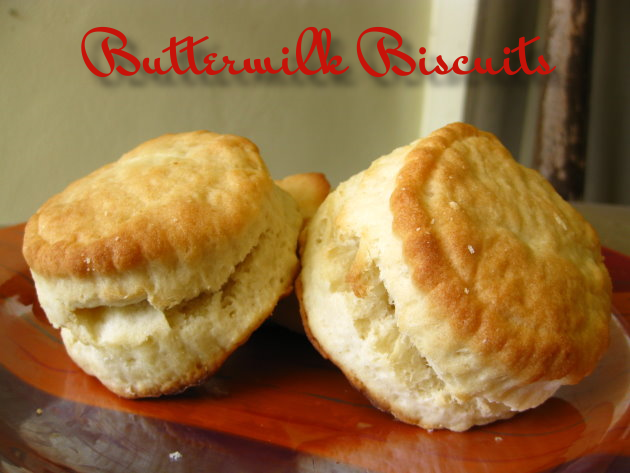 "BISCUIT SAVVY: Recipes usually instruct the baker to knead biscuit dough briefly after mixing. The word "knead" is a misnomer, however, as the action of folding and pushing biscuit dough is a far more delicate technique: Pull the dough over itself from the far side, making a double layer, and then, with the palm of your hand, push the dough forward with only the lightest pressure, to smear some of the small butter pieces in the dough. Give the dough a quarter turn and repeat to make 6-12 brief strokes, no more, adding flour 1 tablespoon at a time if needed to prevent sticking." 1) Preheat the oven to 425F. Line a baking sheet with parchment (baking) paper. 2) In a food processor, combine the flours, sugar, baking powder, salt, and baking soda. Process briefly to mix. Add the butter and, using pulses, cut the butter into the dry ingredients until the mixture resembles coarse crumbs. Add the buttermilk all at once, and pulse just to moisten all the ingredients. The dough will stiffen during mixing. It should be slightly shaggy, but not overly sticky or wet. Do not overmix. 3) Sprinkle a board with cake flour. Scrape the sides and bottom of the work bowl and turn out the dough; it will be very soft. Sprinkle the top with cake flour. With floured hands, gently knead the dough just a few times. Press and pat the dough into a loose rectangle about 1 1/2 inches thick. With a plastic dough scraper or large rubber spatula, fold the rectangle like a letter, overlapping the short sides in the middle to make 3 layers. Roll or pat out the dough into a rectangle 1 inch thick, sprinkling a little flour beneath the dough as needed to prevent sticking. Using a 2 1/2-inch biscuit cutter dipped in flour, cut out the biscuits by pushing the cutter straight down and lifting up without twisting. Cut as close together as possible for a minimum of scraps. Pack together and reroll the scraps to cut out additional biscuits. 4) Place the biscuits on the prepared baking sheet, spacing them about 1 inch apart. Bake until the biscuits are firm to the touch and the tops and bottoms are golden brown, 15-18 minutes. Let rest for a few minutes, then serve hot.